These were excellent! And they’re from the Genomics Cafe where I work at Princeton University. Same people who run Prospect House, Restaurant Associates. While I haven’t seen them for sale in the Cafe itself (how about it guys? ), they made an appearance on the dessert table for an event they catered for us. 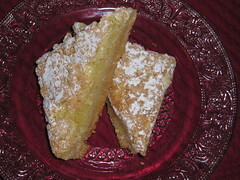 I’d asked for something different, suggesting lemon bars, and they came up with these wonders. What made them so special was the crisp, almost meringue-like, topping. Just a thin layer of crunch, but it raised this treat from ho-hum to wow! I have been searching the internet for a recipe for these, to no avail. I do find recipes with a thicker meringue topping, but not the crackling thin that this is. Was it a fluke? If I get the recipe from the chef (if, in fact, they were made in-house…), I’ll let you know.